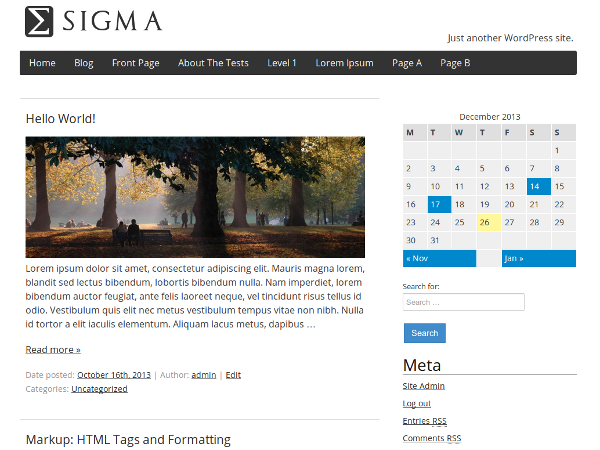 Sigma is a lightweight and responsive theme, with a fluid grid system based on getskeleton.com that adapts your website to mobiles, tablets and desktop devices. The theme comes Event Organiser ready, with specifically designed templates for event, venue and category pages, as well event list widget and shortcode template. The theme is early in development, and feedback is welcomed. A preview of the theme can be found here: https://wp-event-organiser.com/demo. More features will be added over a time, and will in part be guided by feedback.